Just when you thought Instant Pots couldn’t get more convenient. If you’re like me, there are days when you simply don’t have the energy to make complicated dinner recipes. After a long, stressful day at work, the last thing you want to do is gather up 20-something ingredients to prep, measure, and cook—it’s just too much! However, when this mood strikes, it doesn’t mean you have to order takeout (though, if that’s what you want to do, all the power to you). Instead, break out your Instant Pot and pull up one of these five-ingredient recipes. That’s right—you can count the number of ingredients on one hand, and as an added bonus, most of these meals are ready quickly thanks to the Instant Pot’s fast-cooking nature. They’re ideal for when you’re busy, unmotivated, or a combination of the two. If you don't already have an Instant Pot, we wrote a guide to choosing the best Instant Pot to help you find the perfect fit for your kitchen. 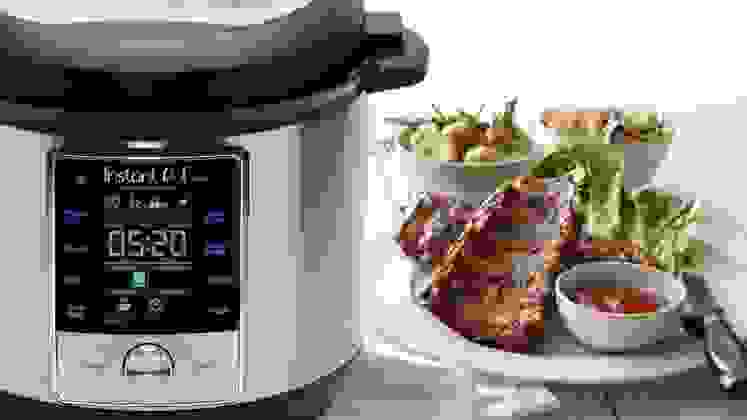 These electric pressure cookers can cook meals that usually take hours in minutes, and they also have functions that allow you to get rid of your slow cooker and rice cooker to make more room in your cabinets and cut back on clutter. They're amazingly easy to use, especially when you've only got a handful of ingredients to prep, like in these 10 mouth-watering recipes. Your whole family will love this creamy, delicious Instant Pot Mac and Cheese. It’s certainly not the healthiest recipe ever created—the ingredients are macaroni, butter, cheese, and milk—but it’s perfect for when you need to get food on the table ASAP. The whole thing takes just 15 minutes to prep and cook. Traditional recipes for baby back ribs often take over an hour to cook, but you can expedite the process with this recipe for Instant Pot Barbecue Ribs. As long as you have the five basic ingredients (ribs, barbecue rub, barbecue sauce, broth, and apple juice) in your pantry, you’ll have a full rack of fall-off-the-bone ribs ready in as little as 30 minutes. If you’re a passionate home cook, it might seem like a sin to use frozen meatballs, but if they taste good, who’s really complaining? This recipe for five-ingredient Instant Pot Spaghetti and Meatballs makes a perfect weeknight dinner, especially since you can tweak it with your favorite brand of sauce or meatballs. Carnitas are essentially the Mexican version of pulled pork, and you can eat the tasty meat in tacos, on sandwiches (tortas! ), or even over a bed of rice like a burrito bowl. This recipe for Instant Pot Carnitas takes a little longer to make than most meals on this list, but if you whip up a big batch at the beginning of the week, you can get several meals out of it. Put down that phone! You don’t need to order takeout to get your fix of orange chicken. This five-ingredient recipe for Instant Pot Orange Chicken takes just 15 minutes to make—less time than it would take to have food delivered (and still hot when you're ready to eat). Rice and beans is an underrated meal, in my opinion. Not only is it delicious, affordable, and easy to customize, but it also provides you with all of the essential amino acids you need. What more could you really ask for? If you’re in the mood for this easy dish, try out the Instant Pot Rice and Beans recipe from From My Bowl that will be ready in less than a half hour. Chances are you already have most of the ingredients for these Honey Garlic Instant Pot Chicken Breasts in your fridge and/or pantry. It’s a great way to put a unique twist on a classic weeknight meal—just serve it up with some rice and veggies, and you’re good to go. Instant Pots aren’t just good for making dinner! This recipe for Instant Pot Hot Cocoa would be a perfect beverage for a winter weekend or the next time your kids are having a sleepover. Be warned, though: Your family may never want to use boring hot chocolate packets again! There’s nothing like a warm cup of soup on a chilly day, and with this easy recipe for Broccoli Cheese Soup, you won’t have to spend an hour cutting up vegetables. Just dice the onion, throw everything in your Instant Pot, then cook for 10 minutes. Boom, done and delicious. "I swear by this recipe," Samantha Gordon, one of Reviewed's editors, told me. "It's insanely easy to make but it tastes like it took lots of love and time, especially if you use a decent immersion blender to make it a tiny bit smoother at the end." Forgot you were supposed to bring a dessert to the school potluck tonight? Don’t stress! This Instant Pot Peach Crumble by Recipes to Nourish takes all of 30 minutes to make. While technically it uses 10 ingredients—five for the filling and five for the topping—we’ll let it slide because it looks so darned tasty and it's super easy to make.